Jetek, sleepless, walked down the empty corridor and headed for the stars on the ship. Every space vessel had a viewing platform somewhere in its design, its purpose varying from celebration to contemplation. On some it might be a great hall, decorated and warm and beset with equipment to watch the stars. On other, smaller ships, it could be as little as a room with a window and an information vidscreen beside it, where you could call up all human knowledge on the planets in view. This chamber was somewhere in between. It was round, had only one entrance, and its few metal chairs glinted a muted gold in the faint lights from the high ceiling. The walls held Amarrian religious icons, forms and images, but most of these were partly covered by the recently hung banners of House Sarum. Aside from the metal chairs the main type of furniture, spread mostly over the center and far end of the room, was small backless benches, soft and upholstered with a purple, suedelike material. The entire far end of the room was overtaken by a curved wall of transparent polycarb glass, and through its unbreakable wall lay open space, infinite and constant. Vast nebulas the sizes of small kingdoms dominated the view. Sitting on those low benches in the middle of the room made you feel small, almost like a child again. Jetek longed for that feeling sometimes, in these complex times. He came here when the roars of the rivers in his head needed calming, and this little alcove of the moving world, this small forest of metal and stars, never failed to offer its lulling quiet. Jetek had been hand-picked to this crew, as had everyone else. He'd been vetted by psych and doctor teams both, and while he'd never gone to great lengths to advertise his loyalties - he was a crewman, not a politician - they stood unquestioned. Which was why he was onboard this ship, entrusted with bringing Empress Jamyl Sarum to her destination on this multi-day trip. Her retinue kept to itself, maintaining court in their section of the ship's living quarters, and while the crew was permitted to enter at will, their intermingling with the royal entourage was subtly discouraged. One knew one's place on this ship. So when Jetek entered the room and sat on one of the benches, with most of his own crew safely asleep and the Empress's own people presumably all secluded in their part of the vessel, he did so with the expectation that it would be as blessedly empty as it had been all the other times he had taken refuge there. When someone cleared their throat, it raised the hairs on the back of his neck, and when he turned and saw who was standing in a darkened part of the room, he felt like his skin was going to tear itself off his body in fear. Everyone had known who Jamyl Sarum was, long before she reappeared, and everyone knew exactly what she'd done in the recent Minmatar invasion, though no two stories of the event ever seemed to match. All agreed, though, that she'd stopped the Minmatar in their tracks. She carried with her a reputation so legendary that it was reaching mythological levels, and her images showed an extraordinary beauty that brought decidedly secular thoughts to the minds of young men. She was as godly as anyone in this world could be. 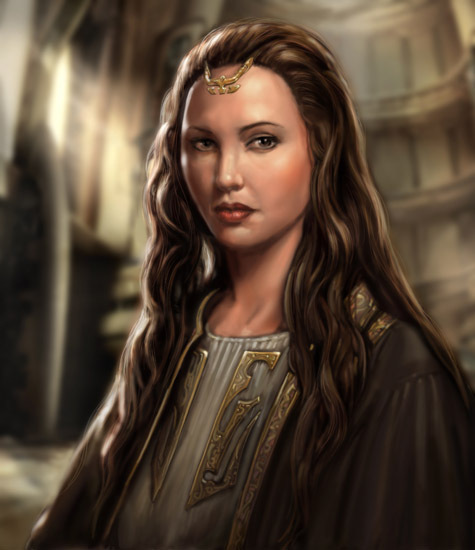 Before him, not ten steps away, stood Her Highness, the ruler of Amarr Empire, Empress Jamyl Sarum the First. He made a noise somewhere between a mewl and a stuttered choke. She stood there and regarded him, then took a few slow steps closer. His legs, now made of jelly, wanted to run away but didn't manage more than a twitch. In some panic-frozen part of his head he was thankful the fear had paralyzed him, for running away blindly from Her Highness would likely be one of the very few things even worse than walking in on her without leave or purpose. "What is your name?" she said. He merely stared back, unable to speak. She stepped closer. Her brown silk robe trailed behind her like a second shadow, and the gold decoration on its folds glinted in the faint light. Her long chestnut hair cascaded down her back, so dark that it was almost indistinguishable from the robe. She smiled at him, which made it only so much worse. "I'm tired of speaking to no one but my retinue," she said, in a voice that felt like warm sunlight. "It is stifling. I want to reach out to others, particularly the isolated souls in the darker reaches. We mustn't ever fear the unknown." She leaned her head to one side. "Are you all right? You're gaping wider than a Slaver at feeding time." His throat decided to let air through at last, and as he gasped he found his voice. "Empress, I'm so sorry, I didn't mean to intrude, forgive me, I'll be off-"
"Stay, please," Sarum said. "I could do with the company. On this long journey there's been little else to do but think, or talk to oneself." "I really didn't mean to sneak up on you, Empress, and I don't think I should be this close-"
"Oh, hush. I don't feel the slightest bit insecure. And I heard you coming," she said. This surprised Jetek, who could have sworn he hadn't made a sound when he entered, but it put him at ease. He rose from his seat and kneeled in front of Sarum for a moment, then got up again and went to the window, standing there at a respectable distance. She walked up to him, making his skin crawl again in apprehension, and stared out at the same stars. "What is your opinion of God's great work?" she said. She gave him another wonderful smile. "The skies, Jetek. The seas you sail." He thought about this, hoping to stop sounding like a moron. The best he could think of was to say, "I think they're wonderful, Empress. That's really the only word I can think of." "It's a good word," Sarum said. "But what about the people who inhabit them?" "Some of them are wonderful too," Jetek replied, biting his tongue lest it left his mouth. The Empress's alignments would be different than the Chamberlain's, and going against the supreme leader's worldview was a bad idea no matter how likeable they might seem. She seemed to notice his hesitation, for she smiled and said, "Yes. Some of them are wonderful indeed. But what about the ones who are not? What should we do about them?" "I'm sure Her Highness knows best," Jetek replied promptly. She looked back to the stars, giving no hint whether she approved of his noncommittal answer. But her expression changed, growing steely and blank. It reminded Jetek of nothing so much as passing to the dark side of a planet. He hoped he would make it out of the room alive. "There was someone, I forget his name. I did everything I could in difficult circumstances and it wasn't enough for him," she said. "He had to take a stand. For some, when they're desperate, it simply isn't possible to solve things reasonably. They must have noise and fire to match whatever's in their heads." "So what do you do?" Jetek asked, despite himself. She fixed him with a steely glance. "You react. Sometimes you have to hurt someone to make them understand how badly they're hurting themselves. You have to come to the rescue by being the villain, not just for them but for everyone they touch, lest they lose themselves in that same hellish fire." She turned away from the stars and took a seat, never letting her gaze waver from Jetek's presence. "So there is punishment, which is the wrong word for the right thing, something that marks them for life, brings them under control, makes them a productive part of society. What's the word I'm looking for, Jetek?" "I wish I knew, Empress. I truly do." Jetek remembered this man. His name had been, and likely still was, Kerrigan Orsha. During a fiery speech he had shouted at and berated Jamyl Sarum in an open assembly, calling her names that really shouldn't be uttered at the impending supreme ruler of one's own empire. The assembly session had dissolved into chaos and Orsha's own family had renounced him in an attempt to save themselves. It had worked, after a fashion: Lord Orsha had been judged and found guilty of heresy, a charge that carried the death sentence, but the Empress had granted him clemency of a sort. Instead of death, she had decreed that he have the words of his outburst tattooed on every part of his skin. She had offered him the option of withdrawing to a convent to study the scriptures for the remainder of his life, which he had gratefully accepted, his old and public life effectively ended at this point. The Empress had a faraway look. She said, "... Benediction." "I wanted to bring him into our fold, for if I hadn't, he would have railed and thrashed until he shook himself to pieces, and we'd have had no choice but to put him out of his misery," she said, looking to the stars again. Her expression softened, and it was like the sun rising again. "Do you think I'm beautiful?" she asked in a much milder tone. "Yes, Highness," he replied without a moment's thought. "Do you think I'm awesome?" she asked, every syllable of the word clicking smoothly into place. "Yes, Highness," he replied again. "Do you think I'm terrifying?" she asked, as if they were all the same questions. "Yes, Highness," he said, understanding that in fact they were. Quiet fell on them. Nothing could be heard but the hum of the ship itself, the tiny little creaks and thrums that came from anything alive and moving. It consistently amazed Jetek how something so powerful could be so quiet. She was still looking at him with that faraway gaze, though whether it was in expectation, or if she was merely lost in thought, he couldn't tell. He didn't dare disappoint her, so he said, "It's more mercy than he could have expected before your time, Empress. People ought to have respect." She nodded and stood up, walking to the window. The silk of her robe hissed softly as it was drawn off the seat. She said, as if to the stars, "The man had five children and twelve grandchildren. He had friends, even if he's lost them now. He was a known person. And respect, just as the lack of it, is like little fires that need to be kept lit and alive." The ship turned slightly, creaking. She looked back at him and her expression resembled the sun itself now, blinding and majestic, peaceful and soothing, focused and completely engulfing all at once. It was like being cradled in the arms of the end of the world. "On his flesh, among the words of scripture, we tattooed the names of his children and his children's children," she said, and Jetek would swear to his final days that something flashed in her eyes, as if wanting to break free, "And he will never forget who he is, or who we are." She fell silent again. He swallowed audibly, realized his mouth was hanging open, and snapped it shut. "But you won't tell anyone about this meeting," she said. There was no menace in her tone, no threat nor promise of danger; merely a relaxed, even concerned, conscience. "Of course not," she repeated. "I know you won't." The stars seemed cold and uncaring to Jetek, and his fate like a stuttering flame, soon extinguished. The Empress looked out at those same stars. "We need to save them, all of them, from themselves. We need to reclaim their fates and envelop them in ours. And we need to love them, no matter how much it hurts." She touched the glass and added, "All these wayward children."